Tony Yang co-founded Multimedia Tennis alongside John Togasaki. Tony’s enthusiasm for the game helped lay the groundwork for convincing John to join him in starting up Multimedia Tennis. Through the Multimedia Tennis platform, Tony strives to help players uncover facets to the game that they can’t see with their own naked eye, correct what they cannot feel through technical analysis, and document memories of their tennis lives with innovative offerings. Tony is certified in video analysis by Dartfish as a Dartfish Certified Technologist. Tony has provided Dartfish filming, processing, and stroke analysis to USTA Norcal Regional Training Center (RTC) camps since its inception in 2010. In addition, He has been recognized by USTA Player Development for his efforts as one of the very first participants in its Tagging Project in helping them tag professional tennis matches for scouting purposes – including tagging live USA Davis Cup matches. Tony was the Director of Video Production and Analysis at Eagle Fustar Tennis Academy. Tony also has a passion for coaching and is a USTA Certified High Performance Coach. He loves to work with players of all levels to reach their potential. His players have achieved personal bests under his guidance. These results include 5 star & blue chip ratings on tennisrecruiting.net, #1 Norcal, top 25 USTA, top 40 DI ITA, and ATP and WTA world rankings. His players have gone on to play college tennis in Division I programs such as Texas Tech, Santa Clara, Stanford, Columbia, Harvard, Carnegie Mellon, and Whitman College to nationally ranked Division III programs such as Pomona-Pitzer. Tony has served as a member of USTA Norcal’s Coaching Commission and has coached at Eagle Fustar Tennis Academy since its inception. Tony played collegiate tennis at UC Berkeley, and he played professionally briefly after college. Tony has been the #1 ranked Norcal player in both the 30s and 35s. He also took 5th place at the National Grass Courts 30s held at the Philadelphia Cricket Club. He and John have also been the #1 ranked 5.5 doubles team in Norcal. 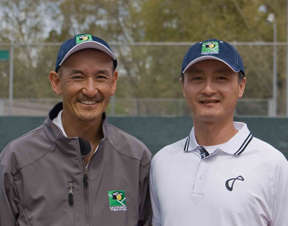 John Togasaki joined Tony Yang to start Multimedia Tennis because they share a passion for teaching tennis that goes beyond the tennis court. John's background in the high-tech world with over 20 years of experience at Sun Microsystems and a couple of startups, combined with his experience in tennis competing, studying the game, and coaching give him a unique set of skills to combine technology with tennis. He wants to use technology to help tennis players in new ways, and he wants to create new ways for tennis players to preserve old memories. John is a Partner and General Manager at Mountain View Tennis, based at Cuesta Park in Mountain View. As General Manager, John is responsible for the operations of Mountain View Tennis, including the pro shop, court scheduling and maintenance, programs, and coaches. He also spends time on the court teaching many of the Recreation classes as well as private lessons and small groups. Before Mountain View Tennis, John coached at Eagle Fustar Tennis Academy since 2003, and he co-founded Doubles-Experts with Tina Okawa, where he specialized in doubles clinics for adults as well as clinics for young kids. As a player, John has been ranked as high as #13 nationally in Men's 30 singles, but excelled in doubles, ranked #1 several times in NorCal 5.5 men's and mixed doubles, and reaching the finals of the Mountain View Open Mixed Doubles three times. John is a long standing member of several USTA NorCal committees, has served on national USTA committees, and is the official seeder for USTA NorCal Women's and Mixed Open tournaments.